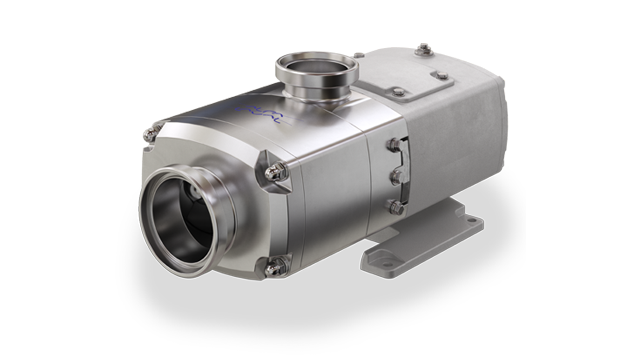 Designed for process flexibility, the Alfa Laval Twin Screw Pump is built on a robust, reliable platform that meets stringent hygienic standards. It is capable of handling both product transfer and Cleaning-in-Place (CIP). Its low pulsation characteristics and excellent solids handling capability reduce the risk of product damage, thereby improving product quality. Maintenance is simplified and process uptime increased. Designed for handling sensitive, abrasive and high and low viscosity fluids, the Alfa Laval Twin Screw Pump is ideal for use in hygienic applications in the dairy, food, beverage and personal care industries. Its quiet, virtually pulse-free, smooth and gentle operation makes the pump an excellent choice for handling sensitive products. The Alfa Laval Twin Screw Pump combines process duties typically handled by positive displacement with CIP duties typically handled by centrifugal pumps. 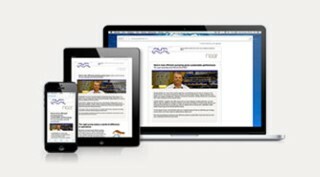 This provides a robust and reliable platform that offers greater process flexibility. Two-in-one operation provides easy handling of process media of varying viscosities as well as CIP fluids. This simplifies piping and pump control, cutting costs and minimizing contamination risks. Superior suction performance with excellent lift capability and low NPSHr provides installation flexibility and increases product recovery. A robust, all stainless steel gearbox with timing gears located between bearings, provides an optimized bearing span. Balanced loading of the shaft assembly reduces vibration and noise, increasing component life and reliability. The oil chamber design enhances bearing and gear lubrication, increasing bearing life and minimizing gearbox running temperature. Easy access to timing gears, whilst the pump is in position, simplifies the process of screw retiming; there is no need to drain gearbox oil or to remove the coupling and motor. 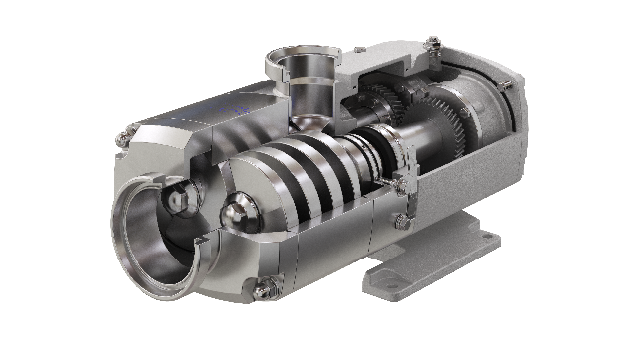 The Alfa Laval Twin Screw Pump features a clean, external stainless steel finish with profiled elastomers and mechanical seals fully surrounded by the product. Designed for maximum cleanability using FDA-conforming materials, the pump is both EHEDG- and 3-A certified. The combination of optimized gearbox design and excellent hydraulic performance provides for quiet pump operation, minimizing noise emissions. Running temperature is also minimized, thereby increasing workplace safety. An optional ATEX version enables use in hazardous zones. Minimize maintenance costs and maximize process uptime. Seal replacement with the pump in place is quick and easy, thanks to a cartridge seal with a truly front-loading, self-setting design. An optional seal service kit provides maintenance flexibility and cuts costs. Easy access to timing gears whilst the pump is in position simplifies the process of screw retiming without requiring drainage of the gearbox oil or removal of the coupling and motor. The Alfa Laval Twin Screw Pump is a positive displacement pump. As the pump rotates, the intermeshing of the two contra-rotating screws, along with the pump housing, form volumetric chambers. These chambers fill with the pumped fluid and move it axially from the suction side of the pump to the higher pressure discharge side of the pump. Nine pumps sizes – OS22, OS24, OS26, OS32, OS34, OS36, OS42, OS44 and OS46 – handle flow rates ranging from 0.5 to 134.3 m3/h, pressures of up to 16 bar, and solid sizes up to 43 mm. Alfa Laval offers a comprehensive range of pumps for hygienic applications in various industries including dairy, food, beverage, home care, personal care, biotechnology and pharmaceuticals. Discover how versatile and reliable the easy-to-service Alfa Laval Twin Screw Pump is. Whether your process fluids are sensitive, contain solids, or have a high or low viscosity, our twin screw solution is up to the task. The Alfa Laval Twin Screw Pump. Delicately Robust. 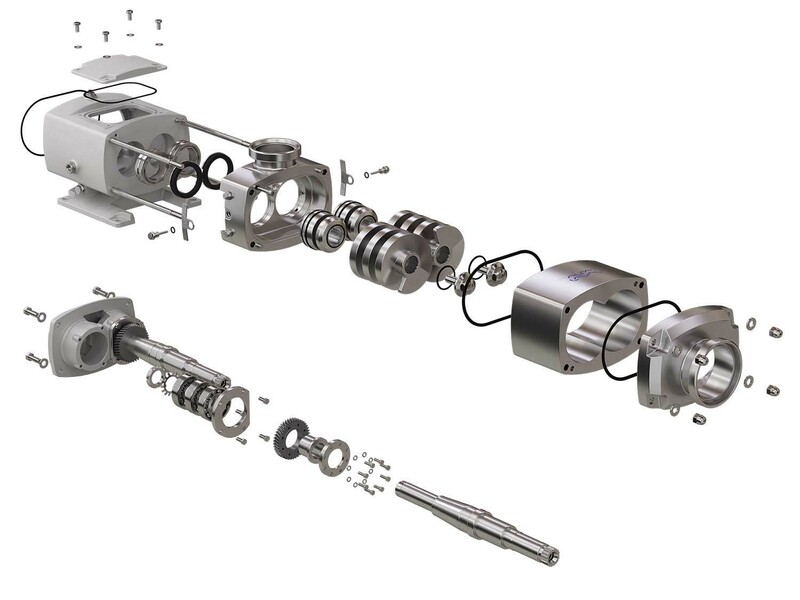 With its smooth, low-shear pumping action, the SRU is Alfa Laval’s core rotary lobe pump for the gentle handling of sensitive process fluids within the dairy, food and beverage, biotechnology and pharmaceutical industries. Alfa Laval OptiLobe rotary lobe pumps are cost-effective alternatives for general applications requiring gentle product treatment and easy serviceability. Prenos modelov izdelka v običajnih ali izvornih CAD-oblikah datoteke. Mogoč je tudi prenos datotek 3D PDF.